Our cat Levi was incredibly friendly and affectionate. We called him our dog in a cat costume because his behaviors were similar to a dog’s - he even played fetch in his younger years. Sadly, Levi succumbed to cancer earlier this year. When he died, I promised my sons I would paint them each a portrait of him when some time had passed and it wouldn’t be so hard to spend so much time with his image. Other commitments caused me to postpone starting these portraits longer than I had intended. In October, I decided it was time to fulfill my promise and cleared some space on my calendar. I had painted Levi before, shortly after I returned to painting again. I had never been happy with that portrait, because even though my painting looked like Levi, I felt it did not capture his sweet personality. Because portraying his personality was as important to me as getting his features correct, I spent a particularly long time drawing these portraits. Levi 11 x 14” acrylic - not for sale. 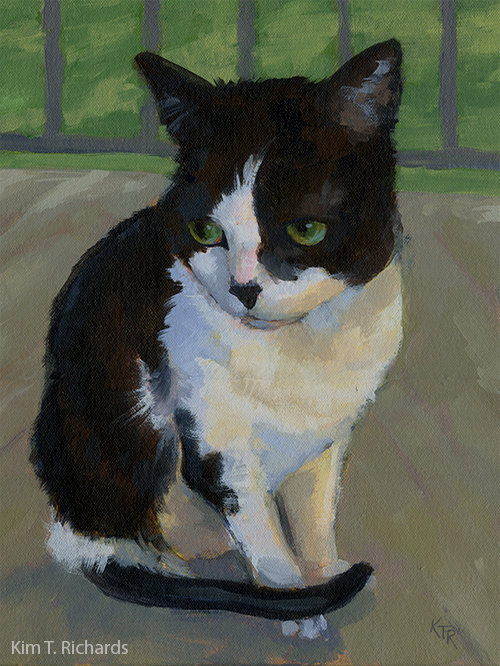 My younger son wanted me to paint Levi on our screened porch, because that was his favorite place to spend time. We took to calling the porch “Levi’s room” and used to joke that we had built it just for him. He was an indoor cat that desperately wanted to be an outdoor cat. Letting him spend his days on our screened porch was a way to allow him to enjoy the outdoors while keeping him and the neighborhood birds safe. I decided to indicate the porch in my painting without adding too many details, because I wanted the focus to be on Levi. Painting a pet I knew well made it both easier and more challenging to paint him. It was easier, because I was very familiar with his facial features and expressions. It was also difficult, because I knew his personality so well, and I wanted to express too many things in this small painting. Most importantly, I wanted to capture his sweet demeanor. Once I focused on that, the paintings seemed to paint themselves. It makes me so happy to have done this for my sons. They will both have this portrait of the pet that was such an important part of their childhoods. I hope they will remember all the happy times we had with our sweet cat every time they look at their paintings. If you would be interested in a portrait of your own beloved pet, send me a message through my contact page and I will be happy to send you more information. I only accept a few commissions each year, so be sure to get on my schedule soon.